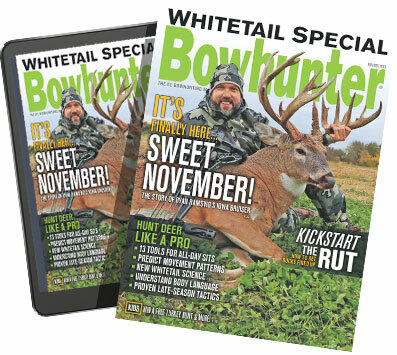 Last issue, I highlighted five dangers — exposure, getting lost, falling, illness, and wild animals — that inspire fear in the outdoors. And I listed five gear and preparation steps anyone can take to eliminate fear and ensure safety, regardless of the circumstances. In theory that’s perfect, but what if your GPS fails, as all equipment can do? You’re toast — unless you use your head. In truth, your brain is your greatest survival tool. With a cool mind, you can hunt worry free, regardless of circumstances, if you do the following five things. As my friend recognized, his lack of caution could have been his downfall. The lesson is, don’t shun or try to suppress rational fear. Accept it, and let it guide your actions. That’s called common sense — the foundation for a long and happy life. 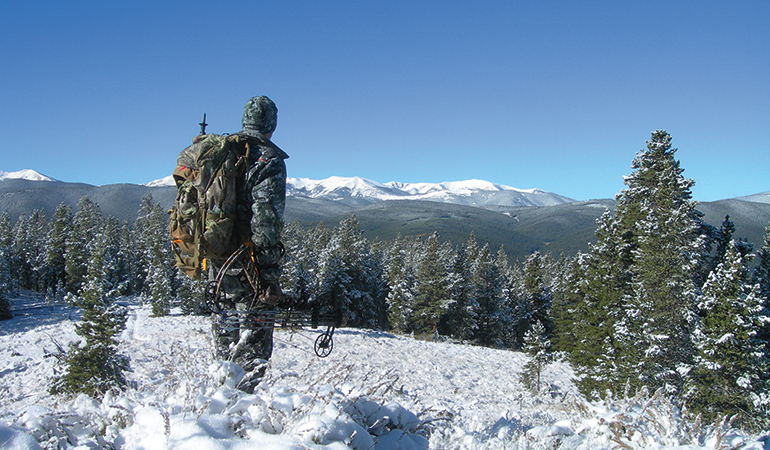 Few people would see much danger in climbing into a treestand, but many might fear a distant mountain. The difference lies in perspective. When you look at the stand, everything looks close and familiar, but the mountain appears huge, distant, and mysterious. Looking at the mountain, you can easily imagine a thousand ways to break a bone, or simply disappear. Forever. To allay fears, never view a mountain as a whole. See it only as one step at a time. The choice is always yours. You can step to the edge of a cliff, or back off. You can vault a big rock, or walk around it. You can walk a slick log, or keep both feet on solid ground. If you take it one step at a time, the mountain is no bigger than the treestand. Late one afternoon I killed a bull elk just before dark, finished dressing the elk after midnight, and headed back to camp. In the dark, however, I could not find my way down a cliff. Finally exhausted, lost, and starting to panic, I built a fire and settled in for the night. Soon I was calm and comfortable. I was home. In the backcountry, things don’t always go as planned, so learn to go with the flow. If you insist on getting back to base camp, or home to your family, delays will create anxiety, even panic, and stupid moves will follow. When things go south, make yourself at home until conditions improve and you get a grasp of the situation. Some years ago, a friend and I debated technology versus woodsmanship: Are hunters trying to replace hunting and survival skills with technology? Does high-tech enhance or destroy woodsmanship? Does woodsmanship even matter? Well, yes it does matter. For one thing, it enhances the enjoyment of hunting, but on a more practical level, it can save your life — even when technology fails you. If you know how to navigate intuitively, build an emergency shelter, and start a fire in the rain, you really have no reason for fear in the wilds. Sure, use high-tech gear where appropriate, but develop woodsmanship skills as well. They’re your failsafe backup. A few years ago, I wrote a column called “Trust Your Horse,” which told how my guide in the Yukon said to give my horse free rein. He would find his way back to camp, even in the pitch dark. And indeed he did — infallibly. Amazing! Okay, you might not have a horse’s instincts, but you have something no horse will ever have — brainpower. Using your head, you can prepare for any contingency in the outdoors with the best gear, equipment, and technology, and you can consciously learn outdoor skills — woodsmanship. Prepared with these tools, you have all the “instincts” you need. So trust yourself, and you’ll be just fine.